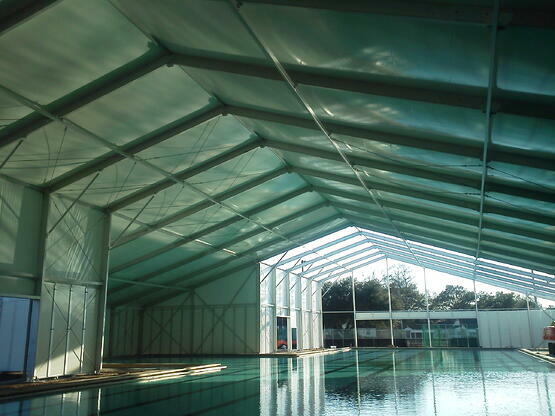 When a South Carolina located company found themselves in need of a custom structure to cover an existing city pool in Charleston, South Carolina, they turned to Mahaffey Fabric Structures to provide a solution. In the winter, pools become practically obsolete. Our customer was looking to empower guests by allowing them to swim regardless of unfavorable weather conditions such as rain, snow, winter weather, etc. By creating a customized pool cover, the pool would be fit for all seasons, allowing it to be used as a forum for children and parents or grandparents to can take classes together. For this project, the structure provided needed to be insulated and posses glass garage doors that could be opened during the summer. The final product resulted in a t-shaped structure, 60 meters long with 4 meter uprights. The structure is 27 meters wide on the two ends and 38 meters wide at its longest point in the middle. 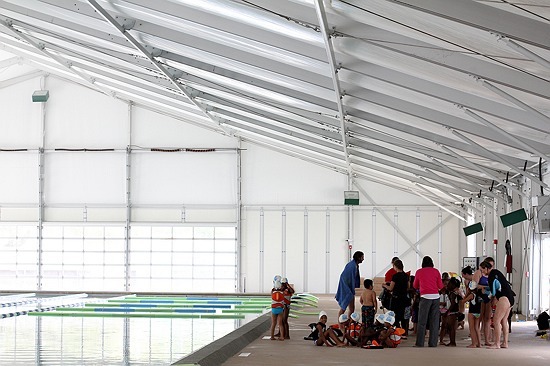 It is equipped with personnel doors, vent fans, special indirect sports facility wide lighting, an insulated top and insulated side walls.Every piece of the structure was custom made, making not only its shape unique. Challenges were abundant with this job. Although we were aware of the project, and its potential challenges, the installation was accelerated, making the timeline an obstacle. Before having all parts and pieces in hand, Mahaffey's crews had to go ahead and begin the process of installing this one-of-a-kind solution. Also, due to an impending strike at the Charleston port, stress levels ran high, with the question of whether or not we would be able to get all materials to the site on time. With the level of customization being required for this project, the design presented a challenge as well. 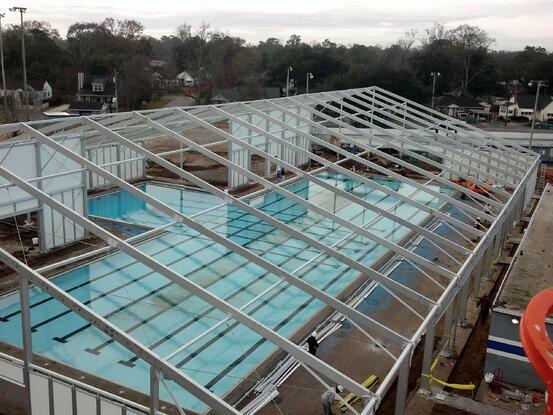 However, with the help of all who were involved, and by trusting our Mahaffey project management teams and installation crews, pool guests, city residents, and our customer alike continued to use the pool all season long. Request a call to talk to a Project Manager about your special needs. Simply click on the button immediately below to get started.